Click the image below to shop all your favorite stores online while supporting SIS. Family Commitment: We all buy groceries, clothing, prescriptions, gifts, etc. By using scrip, you can make a contribution to St. Isidore School at no additional cost. If every school family continues to support escrip and buys a minimum of $350 of paper scrip per month, we will meet our $50,000 goal. Reaching this monthly $350 commitment can be done by buying paper scrip for vendors such as: grocery stores (Safeway, Lunardi's), gas purchases (Shell, Arco), Home Depot, CVS, Chamois Car Wash, Starbucks/Peets, dining (California Pizza Kitchen, Chili's, P.F. Changs, Cheesecake Factory, etc. ), gift purchases (Macy’s, Gap, etc. ), and entertainment (Cinemark, Regal, etc.). 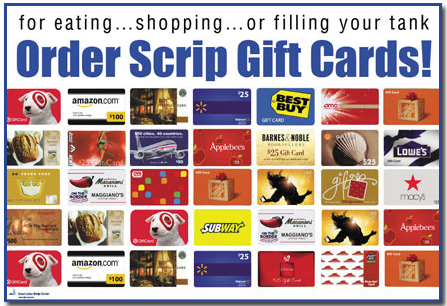 Paper Scrip/Gift Cards: The school makes the largest amount of profit on paper scrip, from 1.5% to as much as 20%. Since the profit to the school on electronic scrip is generally in the 1% to 3% range, the only way to maximize the program and keep tuition costs down is through the sale of paper scrip. Paper scrip is sold weekly through the family envelope. Although we try to keep our inventory well-stocked, we appreciate a one week advance notice of any large orders. Some families have supported our scrip program through purchases made for employee bonuses or client gifts (ie. holidays). eScrip is a website which offers a number of school fundraising programs. St. Isidore School will receive funds from participating brick and mortar stores and websites. A small amount of time setting up your account and the money gets credited to St. Isidore School for purchases you were going to make anyway for as long as you use your cards. Please go to www.escrip.com and sign up, enter your grocery and credit cards. This is one of the easiest ways to support St. Isidore. To get started, please email rmotas@stisidore.org and request a registration link. Once you receive your email from scripsense, click on your personalized link in your email to register. Shop for eGift cards or shop online and a percentage of every purchase goes back to us. It’s that simple! You have the power to help our organization by embracing a lifestyle of giving. We really appreciate you giving back. Please contact Rory Motas, rmotas@stisidore.org, for more information. Look for the pink Box Top on hundreds of participating products. Each is worth 10 cents for your school! Send them to your classroom or into the Scrip Office via the family envelope or drop off in the front office. Box Tops are submitted to General Mills twice per year and your support is greatly appreciated. The website has a wealth of information, coupons, recipes, and tracks our school's progress.